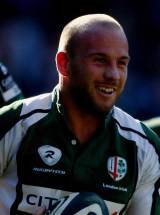 Scrum-half Paul Hodgson joined London Irish from Bristol in 2004, having represented England at U18 and U21 level. A quick, compact player, he represented England Sevens before winning a full cap against Ireland during the 2008 Six Nations. Despite continuing good form at domestic level, further international recognition didn't arrive until England's summer series against Argentina in 2009. Hodgson started the 2009 Guinness Premiership final, when Irish were defeated 10-9 by Leicester Tigers. The following August he returned to Twickenham as skipper of the Exiles' Middlesex Sevens squad, claiming top prize in the Cup competition.